Last day of the round of 16 is finished; time to take a look at what happened on the field today. The game started with the Swiss side looking much focused and ready for the match, Argentina looked very slow and disinterested. Switzerland with high lines was able to pressure on Argentina right at the outside of their box, and their man marking was very rigorous and rigid. This was the main reason why Messi, Di Maria & Lavezzi were having a hard time getting the ball at their feet and once they did the pressure on them was so high that they weren’t able to make a quality pass. The team that looked more poise to score was the Swiss. Breaking in quick counters, using their speedy wingers, and able to reach the penalty area with a minimum amount of passes was helping the Swiss get to finishing areas with quality. No surprise then that the first goal scoring opportunity came to the Swiss. Short corner from the right and the ball comes to an open Xhaka that takes a shot but the ball is saved by Romero. It took 28 minutes for us to see a goal scoring chance. That play woke up the Argentinian side that was asleep until then. Following that play Lavezzi had a shot at Benaglio, which marked the Swiss goalkeeper’s first save of the match. Messi dropped back in midfield to get the ball and it seem to have helped Argentina moving forward, but the two teams were to evenly matched and they would reach halftime locked at zeros. 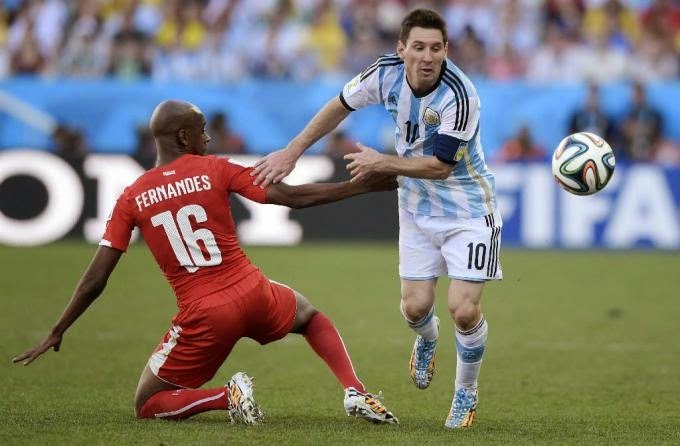 Second half brought a much different Argentinian side. They came in and took over the Swiss midfield and were looking at suffocating the opponent to their own half until they got a goal. Switzerland had no choice but to drop their lines and this rendered Shaqiri ineffective in the second half of the game. He had to resort to defensive duties and was never able to get a quality ball that would allow them to move forward and create any danger. On the other hand Messi had more space and more time on the ball, and the most dangerous play came from the magician. A bad clearance from the Swiss defense, he brings it down with his chest and has an incredible shot over the net. He would have another great shot in that second half but Benaglio saved it, foiling his attempt of taking a lead for Argentina. Argentina’s dominance during that second half was not enough to produce a goal. The game ended in a 0-0 draw and they were headed to extra time. The extra time started the same way the second half did. Argentina was pressing high and Switzerland moving their lines back and defending in their own midfield. Switzerland was looking at scoring in a counter attack but they were having a hard time getting the ball away from the Argentinian players. The game looked like it was going to head into penalty kicks when Lichtsteiner loses a ball in midfield, Messi gets it and dribbles down the Swiss midfield and opens up to the right where an open Di Maria hits it with left foot curving the ball pass Benaglio into the back of the net. Only three minutes left on the clock, and with this goal, Argentina looked like the sure winner. Swiss would make a final push and from a corner Dzemaili has an open header that hits the post. The Swiss came so close to getting a tie and pushing the game to penalties. Shaqiri would get one final chance from a free kick outside the box but the ball hit the wall and the game was over. 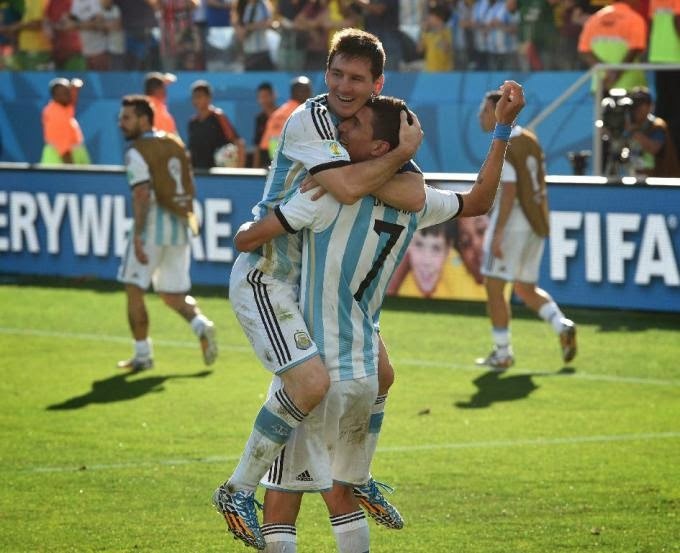 Argentina wins 1-0 with a Di Maria goal in extra time. I was expecting an overly defensive USA side looking to play on the mistakes of the Belgians, but to my surprise the first half was a very even affair. The big surprise was Lukaku being left off the team for this game and the addition of Origi as the sole forward for Belgium. Lukaku has had a very quiet tournament so it makes sense to leave him off for this match, but Origi doesn’t have the same international experience. Belgium had a very strong ten minutes to start off the game, but the USA was able to level the operations around the middle of the park. The match was much divided with both teams causing goal opportunities in front of their nets and having good quality of pass in their build up going forward. USA looked loose and confident, creating chances and having a solid work ethic when defending. USA was forced to do an early substitution due to injury, replacing Johnson for Yedlin. The young man will have his work cut out for him for the rest of the match, but in the first half he showed maturity and good positioning helping his team mates clearing some difficult balls that were pumped in the area by De Bruyne. At halftime the game was tied at zeros and it was a fair result for what both teams had done on the field. Second half brought us a very different Belgian side, with more grit, more strength and more willingness to control the game and go for the goal. They were able to push the USA into their own half and keep them there for the better part of the game. Tim Howard with Besler, were the two men of the second half. Besler was incredible in defense, blocking shots, clearing balls, stopping dangerous plays, for a minute it looked like there were five of them on the field. Tim Howard was a giant amongst men. He saved everything that there was to save. He was incredible for the USA, making save after save, keeping them in the game. The best chance for the USA came in the dying minutes of the game, when a ball is played to Wondolowski, who with only Courtois to beat puts the ball high and wide. That would have been the winner, but instead will go down as one of the worst misses of the tournament. The game would end seconds later, with a 0-0 score. They were off to extra time to find a winner. Extra time started in the best way possible for Belgium. Lukaku was a fresh player on the field for the hard working Origi, and he made an immediate impact. He made a pass to De Bruyne that with a low shot finally beat Tim Howard. Only twelve minutes later and the roles were reversed, De Bruyne with a pass to Lukaku that with his left foot rifled it pass Howard for the second goal of extra time. It looked like this would be it for the USA, losing 2-0 at the end of the first fifteen minutes of extra time. As the first fifteen minutes had started for Belgium, the second half was USA time, with freshly substituted Green, scores only short minutes after coming in to bring the score to 2-1 and give the USA hope that they could equalize. 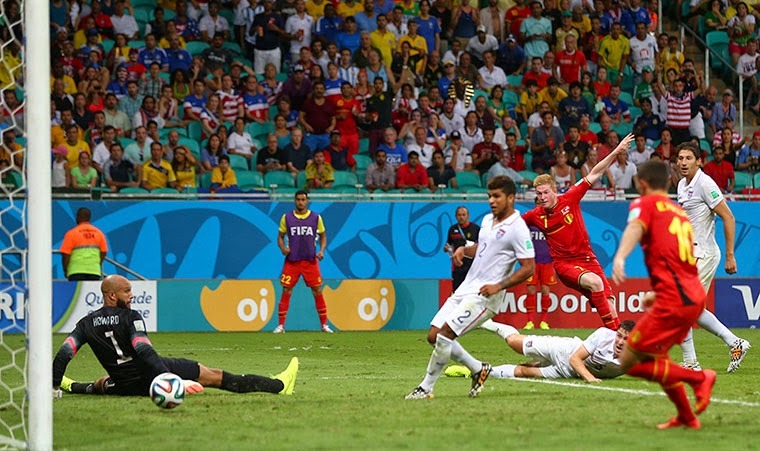 This goal gave the USA extra belief and strength, and pushed Belgium into a defensive shell. For the next ten minutes of extra time it was all USA, they brought it to the Belgian side that was relegated to defending their marginal lead. USA would push forward in a valiant manner but it wouldn’t be enough. Belgium would hold on to 2-1 win and advance to the QF to play Argentina. Kon and Pedro got the two correct winners, but Pedro had Argentina winning 2-1 in AET which was the exact result. Iain only managed to get Argentina victory but not exact result.